I am currently taking part in “The Big Juice Spring Clean“, an international juice cleanse based around Jason Vale’s books “7lbs in 7 days” and “Juice Yourself Slim” and throughout this 2 week period I am sharing a few of my favourite juices with you. 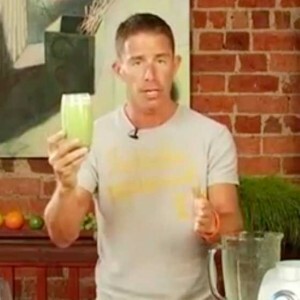 Earlier in the week I have shared the recipes for “Jay’s Famous Lemonade” and “Mean Green” and today I would like to share Jason Vale’s “Turbo Express”. Not only does the Turbo Express smoothie features heavily in the 7lbs in 7 days programme, it is also a family favourite in my home and I would say that on an average weekday this is our breakfast. To make the Turbo Express, simply juice the pineapple, celery, cucumber, spinach, lime and apples, place the ripe avocado flesh in the blender / smoothie maker along with the juice and blend until smooth. When making this I suggest sandwiching the spinach between the 2 apples as this will help get the maximum juice.